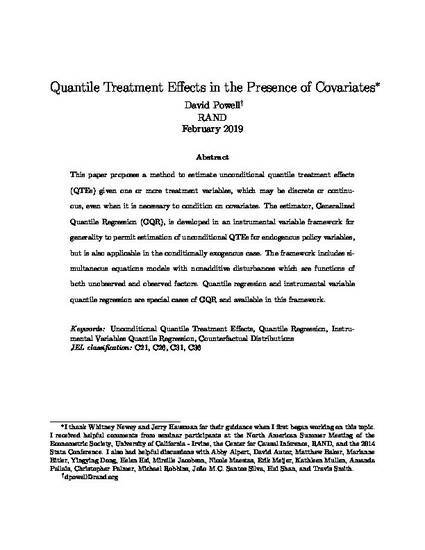 This paper proposes a method to estimate unconditional quantile treatment effects (QTEs) given one or more treatment variables, which may be discrete or continuous, even when it is necessary to condition on covariates. The estimator, Generalized Quantile Regression (GQR), is developed in an instrumental variable framework for generality to permit estimation of unconditional QTEs for endogenous policy variables, but is also applicable in the conditionally exogenous case. The framework includes simultaneous equations models with nonadditive disturbances which are functions of both unobserved and observed factors. Quantile regression and instrumental variable quantile regression are special cases of GQR and available in this framework. Stata package available: "ssc install genqreg"